Lemon Concentrate offers quality products which provide a number of healthy benefits to the consumer. One example is our proprietary dry orange fruit powder. Not only is this substance used within a variety of industrial food service applications, but its vitamin and mineral content boasts countless benefits from a nutritional point of view. Let us take a look at this dry orange fruit powder in a bit more detail to appreciate its uses and advantages. Lemon Concentrate produces this powder using a variety of efficient in-house techniques. It is obtained through a handful of different species of Spanish oranges. The pulp and concentrate are then mixed and atomised. Finally, the product is spray dried. This technique enables the flavour of the powder to be retained while its nutritional properties are not diminished. The processing phase is enhanced through the use of an anti-caking agent. It is generally labelled for sale as either orange extract or orange fibre. The powder can be used within sports drinks, ready-to-eat meals, ice creams and jams. Besides the numerous industrial and food service applications associated with this powder, there are many nutritional advantages with its use. It is high in fibre; aiding in digestive processes. A number of different flavonoids are also present. These substances are critical for cellular repair and some studies have hinted that they can help to prevent certain types of illnesses. Citrus powder has also been shown to contain 17 times the number of antioxidants when compared to pure fruit juice. 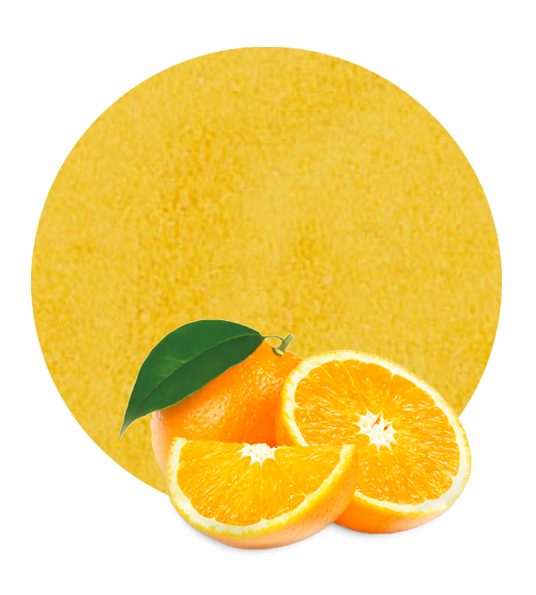 Those who have been searching for reliable dry orange fruit powder suppliers should look no further than Lemon Concentrate.